The end is here, and now we know when it will begin. After months of secrecy and tantalizing teases, HBO has finally unveiled a real trailer for Game of Thrones' final season, along with an official premiere date of April 14th. 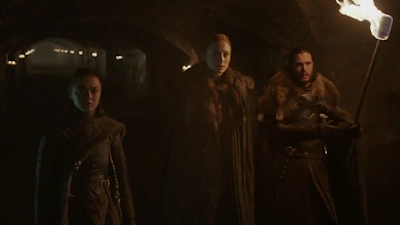 The focus here is on the reunited Starks: Jon Snow (Kit Harington), Arya (Maisie Williams), and Sansa (Sophie Turner), as they are haunted by their family's legacy and the coming of The Long Night. While the threat of the White Walker is ever-present, especially with the teaser's icy conclusion, there's also the Cersei Lannister (Lena Headey) who is holding on to the Iron Throne with a deadly grip. And then there's Daenerys Targaryen (Emilia Clarke), the Mother of Dragons who may be an ally now, but that could change depending on how the chill winds blow. While there are only six episodes this season, each promises to be so packed they'll all go for over an hour in length and the finale promises an epic battle like nothing ever seen on TV before.